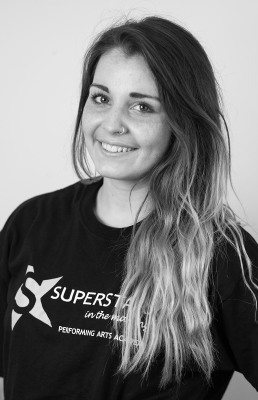 Ruby has been involved with Superstars in the Making® for the past five years appearing in shows including Fame, Grease, Hairspray and West Side Story. Ruby was part of the first team of SITM® China coaches who went out to China in February, and also returned in July 2014 to teach an intensive 10 day course. Ruby is an accomplished elite gymnast having won over 15 Welsh titles, four Celtic Cup titles (a competition between Wales, Ireland, Northern Ireland and Scotland) and competing for Wales across the world including USA, Hungary and France. taken on the role of dance captain in Fame, Grease and West Side Story. From September 2015, Ruby will be working towards her intermediate grade in RAD Ballet with the new Superstars in the Making® ballet school.